Memorial display in Hero's Hall, Kansas City FOP #99 Lodge Hall, which shows all of KCPD's fallen officers from 1881 to present. Union Station, built in 1914, is over 850,000 square foot. During World War II, one million travelers (many of them soldiers) passed through here. Members of the Missouri FOP, Lodge #99 (past and present) while supporting the officers in Ferguson, Missouri. The men and women of the Kansas City Fraternal Order of Police are excited to announce our endorsement for the following candidates running for Kansas City, Missouri City Council. The primary will be held on April 2nd, 2019. 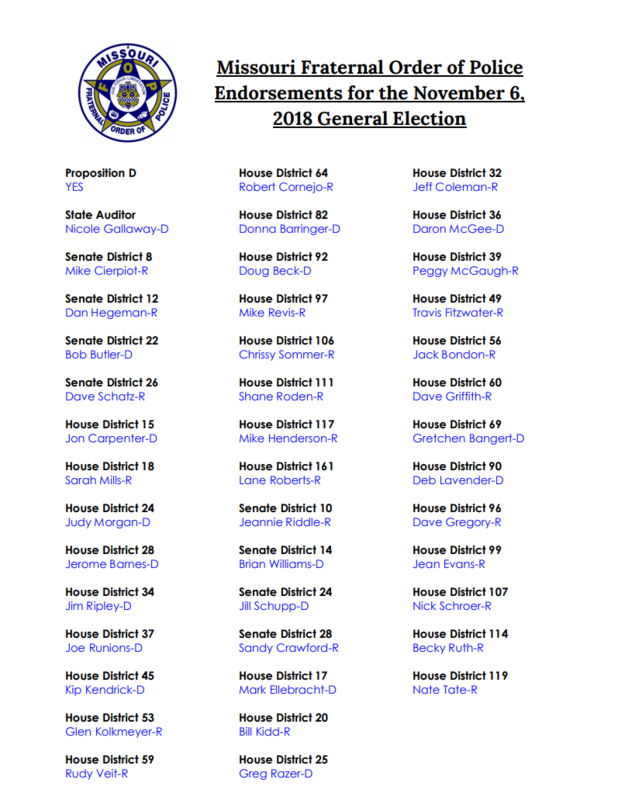 The top two vote getters from the primary will run against each other in a June 18th, 2019 election. Councilwoman Hall is a proven supporter of Law Enforcement. As the wife of a retired police Sergeant she understands the challenges officers face every day. Councilwoman Hall sits on the Neighborhoods and Public Safety Committee. We know we can count on her to have our backs. Kevin O’Neill threw his hat in the ring for City Council because he wants to make a difference and one of his main priorities is working with Law Enforcement to slow the wave of violent crime. We believe O’Neill will support our members and that is why we have chosen to give him our endorsement. Councilman Fowler is seeking re-election in the 2nd District. While on city council Fowler has always been willing to listen on issues facing our membership. He has a track record of supporting Law Enforcement and we believe he is the best candidate for 2nd District City Council. Councilwoman Loar is seeking re-election, a win would mark her 4th term on City Council dating back to 1995. We know we can rely on Loar’s experience and objectivity and she has been a vote we can count on for important issues. Councilwoman Loar’s son is a Sergeant with KCPD and her daughter-in-law is a paramedic with KCFD giving Loar an invaluable and unique perspective in the challenges facing first responders in Kansas City. Melissa Robinson is seeking her first term with the City Council. Robinson’s history with the Ad-Hoc Group Against Crime, where she served as the Director of Crisis Intervention, gives her great insight to the challenges our members face every day on the job. After meeting with Robinson we believe she will be a great supporter of Law Enforcement and bring a new and unique voice to the City Council. Rev. Wallace Hartsfield is pastor at the Metropolitan Missionary Baptist Church, taking over for his father more than a decade ago. Hartsfield is joining the race for the 3rd District, At-Large City Council seat because he says he saw a crisis that government and legislation weren’t solving. We believe Hartsfield will offer a valuable perspective and will work with law enforcement to combat violent crime. Geoffrey Jolley is a Kansas City firefighter and supporter of all first responders. Jolley has worked alongside Congressman Emanuel Cleaver for 13 years to ensure Kansas City and the publics best interest is represented in Washington, DC. Jolley has shown he is always willing to listen with an open mind and we believe he will make informed decisions based on fact and not succumb to public or political pressure. Councilwoman Shields has the experience and knowledge of city government we need. She has a proven track record voting to support law enforcement and currently serves as the Vice Chair of the Neighborhoods and Public Safety Committee. Shields is not afraid to vote what she believes is in the public’s best interest and understands the job we do and challenges we face. Parks-Shaw was an obvious choice for our endorsement for 5th District, In-District. She supports law enforcement and is willing to go against the opposition, if necessary, to protect the publics best interest. Married to a former police officer Parks-Shaw will be the voice of reason we need in the 5th District, In-District City Council seat. Councilman Barnes is seeking re-election for the City Council’s 5th District, At-large. As a member of the Finance and Governance committee Councilman Barnes knows the innerworkings of the city’s budget and know the history of our fight for raises and more police officers on the street. Barnes can be an advocate for issues concerning us and that is why we have given him our endorsement. One of Councilman McManus’ top priorities is safe neighborhoods. He understands the needs of Law Enforcement and what it will take to begin curbing violent crime. Councilman McManus has been outspoken about the crime rate in the city and we believe we can count on him to fight for the resources we need to make a difference. Bough entered the race for the City Council’s 6th District, At-Large seat with an extensive background in law and public service. As an attorney, Bough brings more than 20 years of experience working with local governments. Bough knows we need to do more to address violent crime and we are confident she will be a voice and a vote for Law Enforcement. It's time for the 3rd annual Dana and Parks Bowling Bash KC! Working w/ the Kansas City Police Officers Memorial Foundation, Dana Wright and Scott Parks, co-hosts of the No. 1 talk radio show in Kansas City, have stepped up to raise money to help law enforcement officers and their families rebuild their lives after a tragic loss or devastating injury. The event will be held on April 27th, from 11:30 AM - 5:30 PM. We've expanded to two sessions this year, as the event continues to grow! Please visit www.BowlingBashKC.com for more information and donation, sponsorship and registration information! Click the below image to see a larger version, or download the .PDF at the bottom of the article! 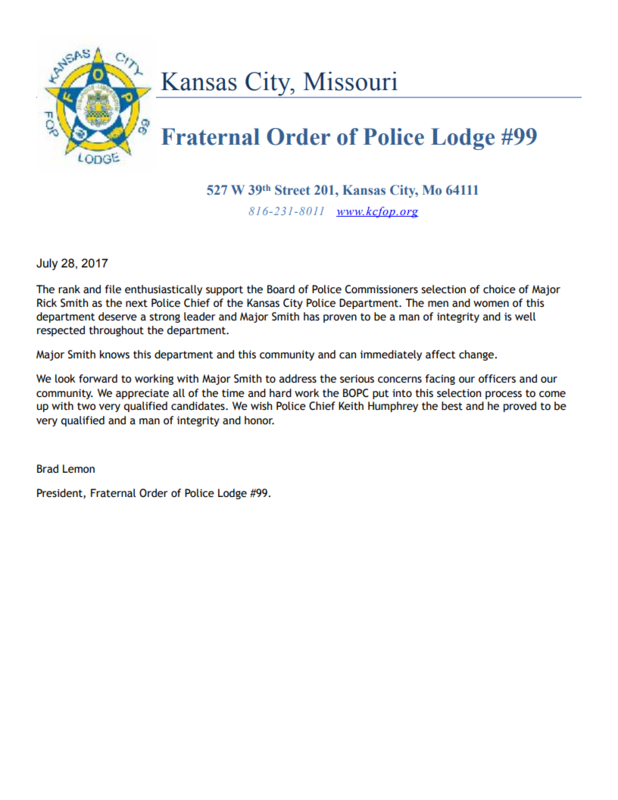 Please see the below letter from Lodge #99 President Brad Lemon regarding the selection of Major Rick Smith as KCPD's next Chief of Police. Four months ago, a close friend of Kurt Gowdy went into sudden cardiac arrest while their families were vacationing at a lake in a remote area. Gowdy immediately started CPR but by the time emergency crews arrived it was too late. Gowdy’s friend passed away. A couple months later, while shopping with his wife at Nebraska Furniture Mart, Gowdy collapsed. He was in full cardiac arrest, and his heart stopped. Just a few feet away, off-duty Kansas City, MO police officer Jon Best heard Gowdy fall and jumped into action. Within moments, Cpl. Louis Cortez, an off-duty Topeka police officer, and NFM security officer Will Williams stepped into help. Williams grabbed an automated external defibrillator or AED. At NFM, employees are trained on defibrillator machines and Gowdy was shocked five times. “I didn’t see any signs of life,” Best said. Best and the others didn’t stop working on Gowdy until emergency crews arrived. Gowdy had just a 40-percent chance of survival. Two days later, Best called Williams to find out if the name whose life he fought so hard to save was alive - a man whose name he still did not know. That’s when Best learned Gowdy lived. “It’s hard to describe. Whenever I knew he was going to be okay just happy. Happy all around for everyone that was there,” Best said. On Monday, Gowdy was reunited with the men who saved his life. defibrillator and the employees trained to use them. NFM honored the officers and security guard and presented them a certificate for their heroic actions. to use his training and lead to the best possible outcome. It was a good day and another example of a Kansas City police officer doing all they can to help someone in need. If you or someone you know has a story about a police officer going above and beyond the call of duty, please email jkiesling@kcfop.org. KCFOP.org Online Store now Open! 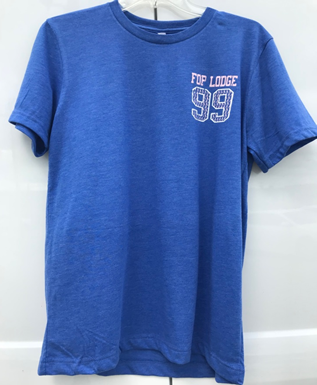 The Kansas City FOP Lodge #99 is happy to announce that our onlne store is now available! You can visit the store by either using the 'Online Store' button on the left side of the main KCFOP.ORG webpage, or clicking the link above. Shirts, Mugs, Golf Towels and much more are available. Please take a minute to browse what we have to offer and purchase some items. To avoid shipping costs - make sure you change 'Pickup Your Order' to yes. KCPD Employees, we will arrange to have your item dropped off or will make it available for pickup at our Lodge. 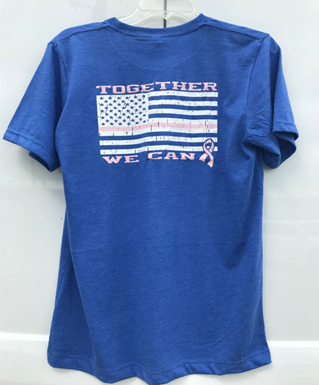 *All profits from the purchase of items on the KCFOP.ORG Online Store go to benefit the KCFOP Political Action Committee. KCFOP Lodge #99 is happy to announce the availability of its new mobile app for your phone, available on the Apple App Store and Android Play Store. This gives you the ability to quickly read any new items posted on the public area of the website. Also, if you're a registered member you can save your username and password within the app so you don't have to constantly re-enter it in the website. You will also be able to access member-exclusive features from within the app, such as the member directory. Setup is easy, once you've registered through the website, download the new App, enter your username and password, and most of the features will be available at the touch of your screen!! Navigate to the Apple App Store or Googe Play Store and search for KCFOP!